Last month was Harry's birthday and it has become something of a tradition for me to bake him a cake with varying degrees of success. It started when I was a Fresher at university and decided to make him a batch of cupcakes before he came down to visit. Of course the kitchens in halls aren't that well equipped so I picked up a box kids 'Make Your Own Cupcakes' from Tesco and in my excitement tipped the chocolate icing powder straight into my bowl of eggs instead of the cake mix. So no cupcakes were eaten that year. For his next birthday I was determined to get it right and went all out with a trip to Poundland to pick up some basic baking equipment and made a chocolate celebration cake with a wall of Kit-Kats around it and filled with Smarties. Other than being really difficult to eat and chocolate overload it was a success and really looked the part. In my third year at uni I decided to make two dozen Captain America themed cupcakes for Harry's 21st. Baking and decorating 24 cupcakes in my dreary student house whilst starting assignments was a bit of a feat in both time and money so I opted to cheat and instead pick up some ready made cupcakes and buy three different colours of fondant icing, food colouring and cupcake cases in Hobbycraft. They were to be vanilla sponge and blue buttercream with the iconic shield balanced on top made from fondant. Instead I ended up dying my hands blue surrounded by tiny cupcakes swamped by blue cases that were far too big for the cakes I'd bought, soggy buttercream drenched in blue food colouring with shields that were about 3cm thick. 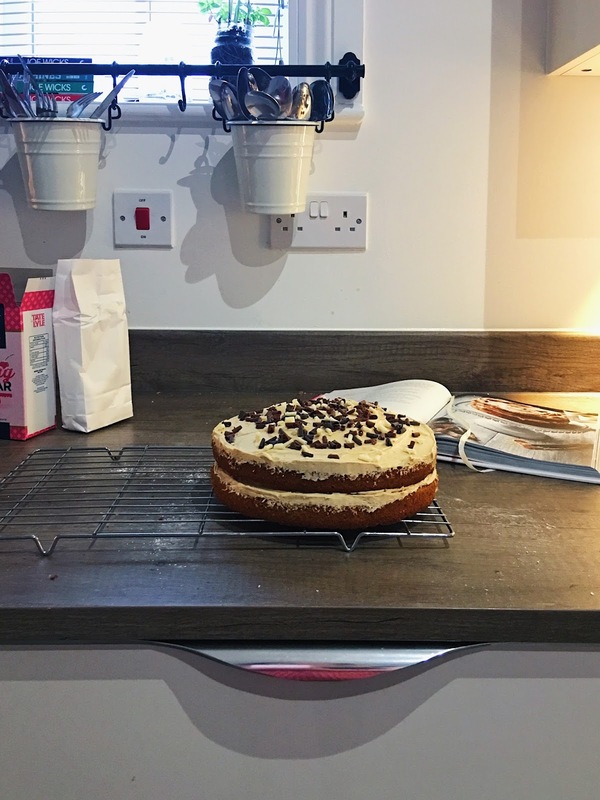 The following years were pretty uneventful but in 2015 I attempted my most difficult cake yet, a Triple Layer Chocolate Orange Cake, and it ended up overflowing all over the oven although, thankfully, my second attempt faired a bit better. As you should be able to tell by now, a successful cake is not always a given so I am always very proud when they turn out well, and this year may be my best yet. 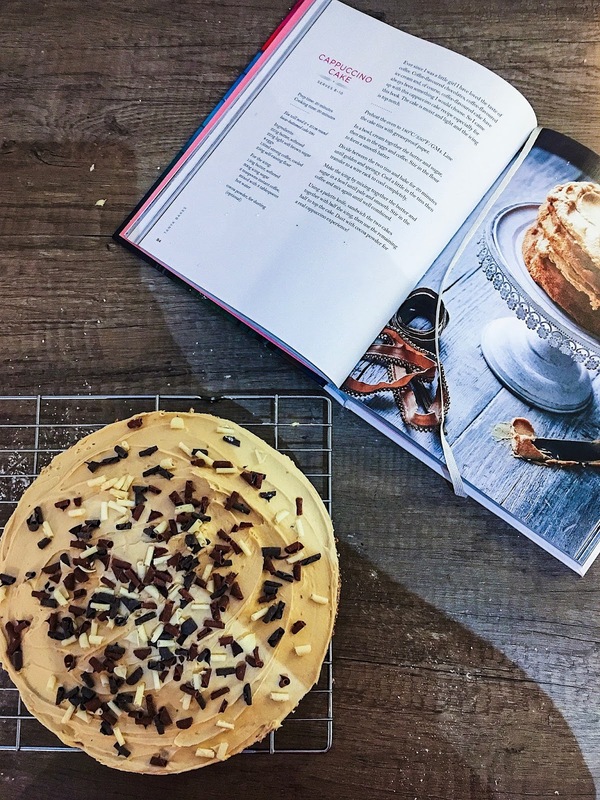 With Harry's birthday approaching I asked what kind of cake he'd like and he picked out the cappuccino cake from Tanya Bakes . It looked simple but not boring so I was feeling confident. 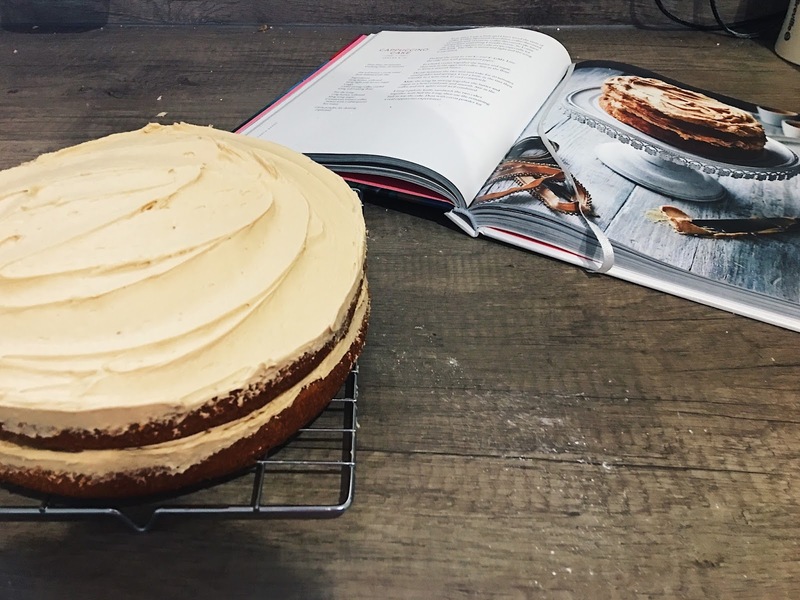 The method is pretty classic for making a cake and I'm now practised enough that I can mix up a batter fairly quickly, the only real difference with this one is the addition of the coffee. When I took the sponges out of the oven I was astounded. They were without a doubt the most even cakes I've ever baked. Whether that is due to the recipe or the new oven in our flat I'm not sure but the tops were completely flat. Next came the buttercream which I spread over with a pallet knife and topped with chocolate curls to make it look a bit more special. Harry was of course very impressed (both with the cake and that I'd made it in one day without any dramas!) and he took it to work with him on his birthday. I was a bit surprised that half of it had gone so quickly (Harry himself ate 3 slices!) but when I finally got to try a slice for myself I realised how delicious it was. Obviously I expected it to taste nice - it is a cake after all - but the sponge was perfectly moist, the coffee flavour was strong but not bitter and it was sweet with the icing but not sickly. Definitely moreish, after eating one slice I could've eaten another. 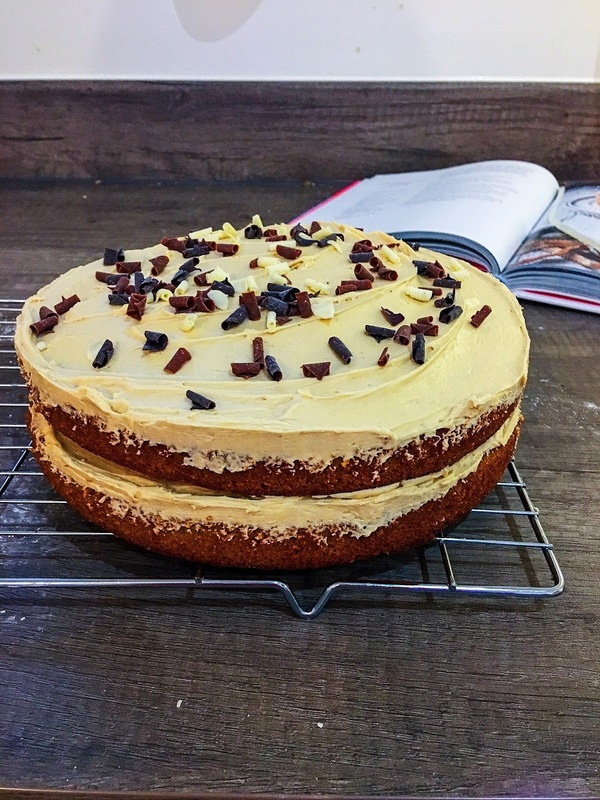 It's the first recipe I've made from Tanya Bakes and I'm suitably impressed. Want to see more Birthday Cakes?